Hi Everyone! What is a “meander book”, you ask? Well, it’s a maze-like mini scrapbook that gets its name from the way its pages are cut and created. Meander books are perfect for documenting one subject, topic or event. They are usually made with one, 12×12 piece of scrapbook paper, but for this project, we are going to use Disney Parks® Maps. When I was in Walt Disney World® for the WDW Radio 7th Anniversary Celebration, I took a lot of photos. And lately, I’ve wanted to craft a small keepsake of each WDW Radio event I have been able to attend. A meander book is very easy to make, but there are a lot of steps. You can make them as big or as small as you like, and embellishments can be simple, like mine, here or elaborate. Wanna fold your way through a meander book with me? Let’s get started, together! If you haven’t done so already, open your Disney Parks® maps and fold them in half horizontally. Keeping graphic placement in mind, completely glue together the top half of one of your 3 Disney Parks® maps to the bottom of another one. Repeat this step for your other Parks map. Look at your folds. Now, starting from the bottom left box, cut up to the last box and leave that one uncut. Move over to the box next to that and cut down to the last box and leave that one uncut. Then move over to the box next to that and cut up, etc. Look at my photo collage (bottom left photo) for what this should look like if you get stuck. Next, fold the boxes accordion (under/over), or zig-zag style. When you get to the two boxes together, fold it under and continue accordion style until the end. Make sure the folds are as flush and crisp as possible. Take a look at your folds, but do not get confused where you glued your maps together. Where you see a fold, that is the bottom of each page/pocket. This step is where many people punch notches out along the open side of each pocket using the bottom half of their circle punch. Not only is this a decorative idea, this can show which side of the page is up, sideways or down, but you don’t have to do this. Take your tape runner and glue the two open sides shut on each page to create pockets. Make sure these pages open separately, as shown in my collage. Next, affix your tabs to your photos. I am using staples, but you can use glue lines or similar if you like. I also like to add a border layer of white card stock, but you don’t have to. I’ve shown you photos and tabs with and without that layering, here. I also like to slightly offset the tabs, so they are all visible around the book. Tabs are a nice feature of any meander book, so I wouldn’t personally skip this step even if you skipped punching notches in the pocket pages. Add your photos to the pockets. If you have more photos than your pages, you can double up. Then, using your scrap card stock and embellishments, mask a portion of your cover to create a title for your meander book. I chose “WDW Radio 7th Anniversary Celebration” and its date, which I found on the WDW Radio website. It just adds a little cohesion to the project, since the pages are portions of Disney Parks® Maps. If you feel like adding journal blocks to the pages, by all means do so, but make sure to leave at least a ½ inch border around the page. Remember, any time you feel stuck, just glance at the photos of the project. And that’s it! 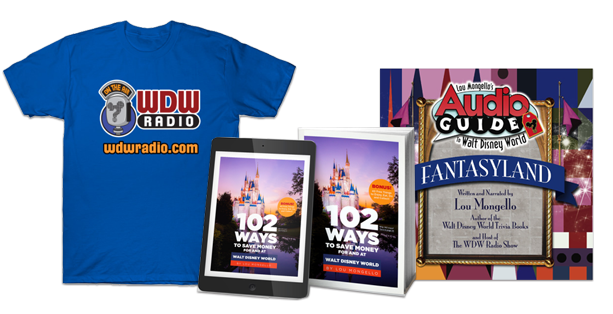 I had a great time crafting a book about the WDW Radio 7th Anniversary Celebration. These meander books are a really easy way to mark one event or topic. They also store nicely together. Wouldn’t it be fun to have meander books for something you’ve done in each of the Four Parks that make up the Walt Disney World Resort®? I’d love to hear what you would do with yours. Feel free to leave a message in the comments below. 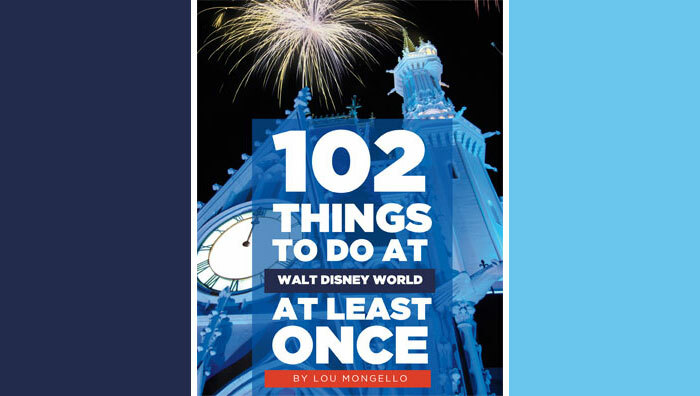 (All photos and photo edits, except for the Twilight Zone Tower of Terror™ ride photo and those graphics on the title page of this project are by Fran Cassano. All of Fran’s photos of Box People and WDW Radio personalities are used with permission). This looks awesome and fun, but I’m lost. is there a youtube video that shows the steps? You can even border your photos with paper from the Parks Times Guides before you tab them, too! The possibilities are endless, so I’ll try to post more ideas using Meander Books. Aww. So sorry you are lost. While I don’t shoot videos for my posts, if you search the for “meander” “maze” or “accordion fold” book videos, there are a ton on YouTube. Just fold your maps in half, horizontally (since vertically, they are folded in four). Then layer your top half of one on top of the bottom half of another. Then glue down completely. Take the top section of that and glue it completely down to the bottom half of the third map. This will give you 3 boxes down and 4 across. Cut up 3 boxes on the vertical fold, then skip the top 2 boxes, then cut down 3 boxes on the vertical fold and so on…up and down, like one continuous zig-zag. I hope this helps. And please let me know how it turns out : ) Enjoy!